want to canoe? is ideally situated on the banks of the River Wye in Hay on Wye on our small, organic, family-run farm. The farm, as well as arable and pasture also offers a gorgeous mile-stretch of riverbank, ancient woodland areas, camping, glamping, BnB and self-catering as well as Hayfield Community Garden, sheep, pigs, chickens, horses and a market-garden raspberry patch! 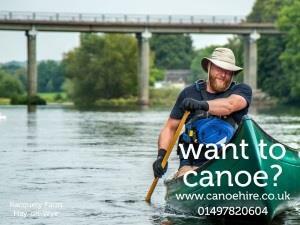 We warmly invite you to hire a canoe or join a Guided Adventure to discover the beauty of the River Wye. The Wye is by far one of the most beautiful rivers in the British Isles and one of the few you can navigate by canoe, without restriction, for well over 100 miles. want to canoe? offer you the chance to embark on a relaxing river adventure from several different points along the way, with an array of different routes to choose from, all with their own unique sights, sounds and smells. This peaceful and ever-changing setting is the ideal place to while away a few hours, spend a day or even a week. Furthermore, what better way to get a bit of aerobic and cardiovascular exercise than canoeing the Wye? Burning calories has never been so relaxing! Why not combine your adventures on the river with a leisurely stroll around the bookshops, markets and historic sites in our friendly and vibrant market town of Hay on Wye. It’s only five minutes’ walk over the bridge to town so make a day of it or even stay over! Open Year Round, weather and river dependent. Half Day Trip: 5.5 miles – £30.00 per person. Full Day Trip: 12 or 16 miles – From £40.00 per person. Special rates apply for children under the age of 16 – please ask! Minimum age is four years.